Welcome to September, the gateway to the new Fall shows. 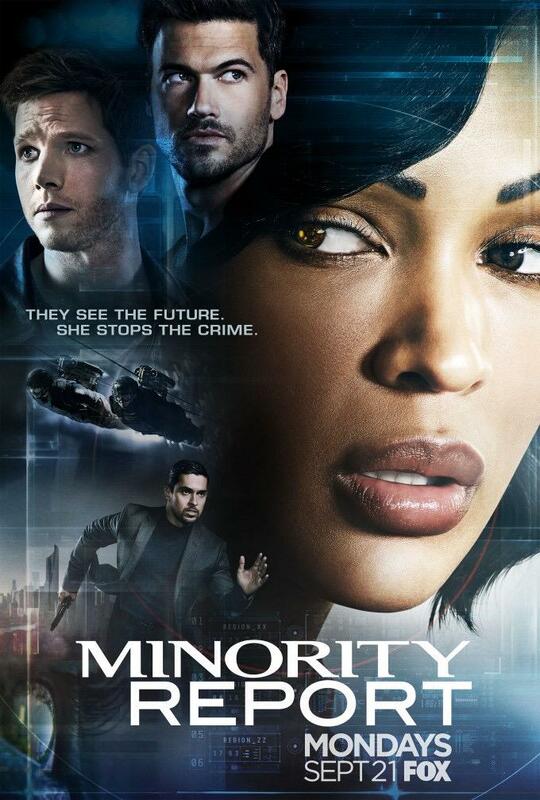 The 2015-2016 season is shaping up to be the year reboots (The X-Files and Prison Break on FOX), a few reimaginings (The Muppets on ABC and Lookinglass on FOX) and some expanded universes, like FOX’s Minority Report. film, Cruise used a trio of psychic kids to find criminals before they’ve committed the crime. In the series, the pre-crime division has been dismantled and the psychics, now adults, have been integrated (poorly) into regular society. Twitchy introvert psychic Dash (Stark Sands) decides to use his powers to fight crime and teams up with detective Lara Vega (Meagan Good) to make that happen. And it is pretty terrible. The film that this is based on is flawed at best with Cruise spending most of his time using glowing, floating computer screens in a “futuristic” way and running. The moral dubiousness of the concept is only vaguely explored and mostly set aside for more action elements. The series though trades out all of the potential for interesting narrative that was left on the floor originally for ever more awkward floating computers and removes the precrime element entirely. Yes, Dash still gets visions, but they are vague and disjointed making the procedural element of the series simply deciphering the vision and saving the victim. It all plays like a less supernatural (and less interesting) version of Angel. Dash’s powers function as a psychic triad with his twin brother Arthur (Nick Zano) and sister Agatha (Laura Regan) meaning that when they are all together, they get the full picture. In the pilot we are told that Agatha just wants to be normal and Arthur is mysteriously missing, leaving Dash alone to try to solve the crimes he sees with the fragmented information he has. And, as Dash has no frame of reference for society in general, it’s up to Vega to integrate him into the world and help solve his puzzles. That only he can see. Which leads to one of the dumber elements of the pilot, a psychic projector allowing her to see his visions. Speaking of suspect technology, in the film Cruise used a glove to activate floating touchscreens. There was much vague swiping in the air as he “scrolled” through his computer. This is the one area that the series has amped up to a truly insane degree. During the crime scene sequence, Good practically vogues through the as she “stylistically” recreates the crime with her future tech. I know that technology of the future is difficult to visualize on television but this is some next level stupid to watch.